After his much acclaimed and successful outing in investigative cop thriller 'Theeran Adhigaram Ondru', Karthi seems like he is set for a rural venture with director Pandiraj. The first look poster for the actor's 'Kadaikutty Singam' was released yesterday which is intriguing. 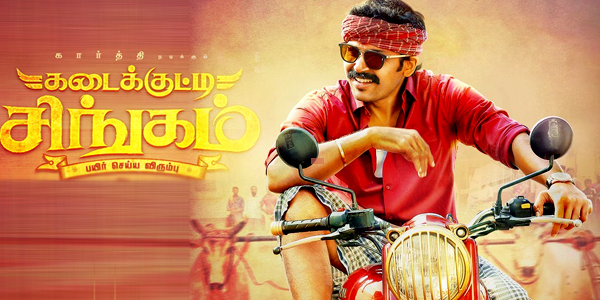 The poster has Karthi riding on a bike whose number plate boasts 'Farmer' along with a tagline that says 'Payir Seyya Virumbu' (an encouragement to do agriculture). With a poster like this, it is expected that the movie will also deal with the issue of farmers and agriculture in general. Apart from Karthi in the lead role the film also has an ensemble cast that includes Sayyesha Saigal, Sathyaraj, Soori, Sriman, Priya Bhavani Shankar, Banupriya and Mounika in other important roles as well. Imman has been roped in to score the film's music while Velraj has been designated as the lensman for the movie. This film also marks the first time collaboration between Karthi and Suriya as it is being bankrolled by 2D Entertainment. In addition to this the poster has also revealed yet another exciting detail that the film will be releasing this April.